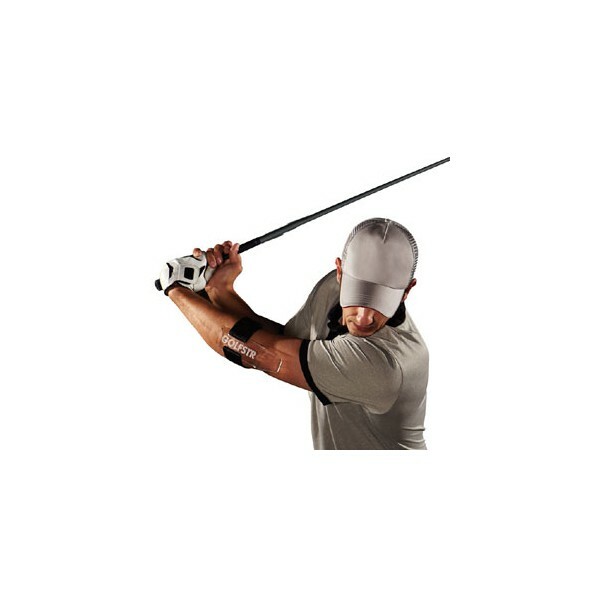 Professional golfers keep their leading arm straight during the back-swing for consistent hits and more power. If it was easy, you would have done it long ago. Use this device to feel and see the difference. It is a 4-in-1 golf game improver! Teach you a straight left arm in back swing! Professional golfers keep their leading arm straight during the back-swing for consistent hits and more power. If it was easy, you would have done it long ago. To help you learn your new swing you can now practice and play 18 holes with this device and feel the difference. This unique swing aid is a revolutionary new golf training aid which helps you feel your arm start to bend in the back-swing as the gently curved end lifts off the back of your arm. It’s a BRAIN TRAINER which allows you to see your success while you play a round of golf. Repeating success builds muscle memory and is the best way to improve your game. Straight arm is straight shots and longer shots without more effort. 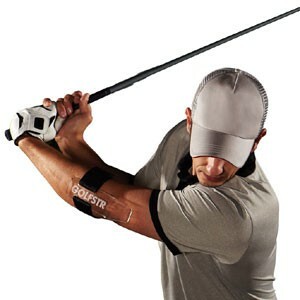 You put the device on your leading arm (left arm for right handed golfers) just below the crease in the elbow. When you straighten your arm the end of the device will presses on the back of your arm. If you bend your arm in the back-swing you feel it lift off your arm. Instantly you understand the limit of your back-swing. Eliminating or limiting the bend will help you hit balls more consistently. By playing a round of golf with the swing aid, you can see your success. By making more consistent shots, you will learn to grove that new swing. You need to practice at the driving range or play rounds of golf using the device to change old habits. You may also need lessons to correct your new swing. Holding your arm straight in the back-swing is a key step to improving your game. Instructions from a golf professional may be needed but you now have the key building block for a consistent golf swing. The key for success is knowing when your leading arm is at the point of bending and limiting your back-swing at that point. Flat Wrist Putting Solution: Hinging your wrist in the putting stroke causes inconsistent control of the ball. For consistent, straight putting strokes you need to lock your leading wrist and let your shoulders and spine rotation create the swing. Chipping Solution: Cupping the leading wrist and scooping the ball at the point of impact creates mishits. For chip shots your leading wrist should bow slightly at the point of impact and never cup to allow the head of your club to flip ahead of your leading arm. GOLFSTR prevents you from cupping your wrist and give you more control and distance in your chips. Golf swing aid and short game aid 4-in-1 device! Improves your swingplane and top position!